Another summer has come to an end and we have had to say goodbye to Julia once again. 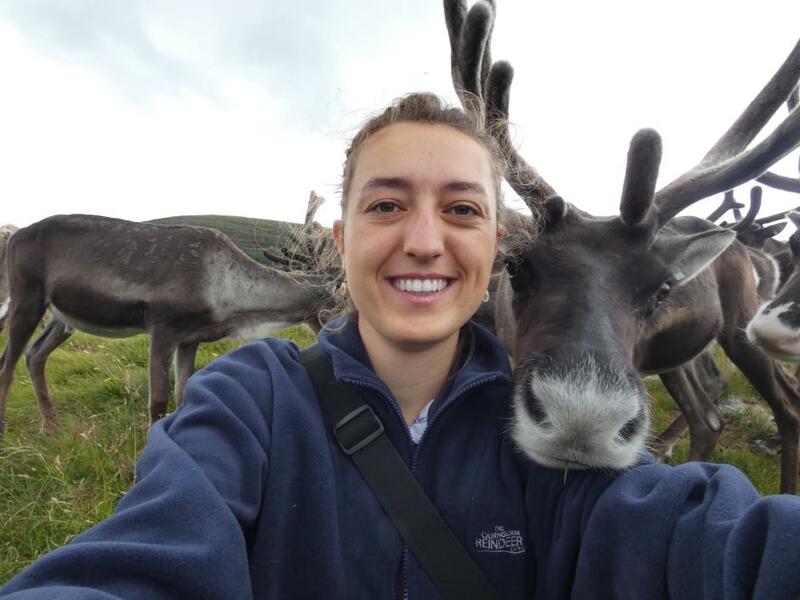 Her parting gift to me after her fourth summer working at the Reindeer Centre was lots of lovely photos to make up a couple of blogs out of. Julia is a talented photographer so I hope you enjoy her photos from this summer. See you soon Julia, we miss you already! 04/07 (1) Starsky at nearly two months old. He still had has winter coat at this point and was not growning any antlers. 04/07 (2) The reindeer gang with Pict leading. They were all on their way to the shed but were a bit wary of me, stopping just for a second before heading into the shade to escape the hot sun. 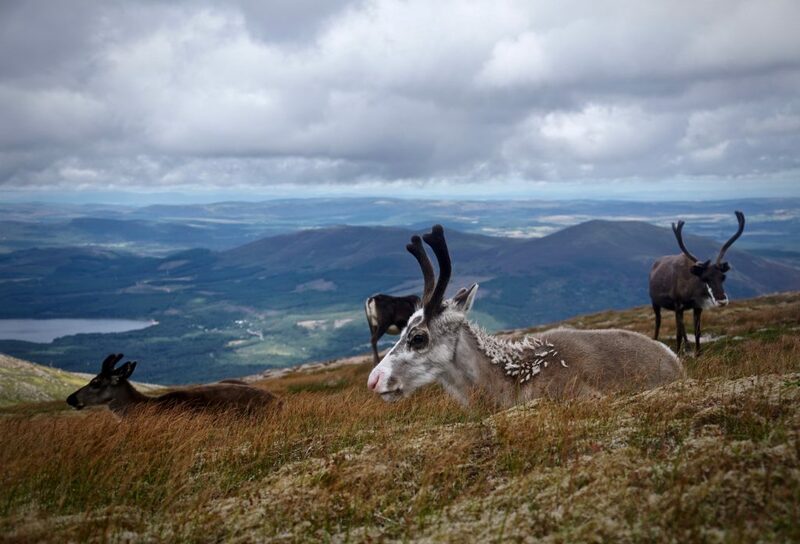 At this point in the summer we had the most amazing hot, sunny weather which was sometimes a bit too hot for the reindeer! 04/07 (3) Here, the light is shining down on the back of our hill enclosure. 23/07 (1) The herd running for their breakfast. (left: Mo, centre: Atlantic, right: Baffin). 23/07 (2) Atlantic was looking gorgeous on this particular morning and was patiently waiting at the back of the group for the line of food to go out. 23/07 (3) Another photo of Atlantic. His antlers are enormous this year and he is now one of our main breeding bulls. 23/07 (4) Ben putting the line of feed out for the herd, they were all delighted! 23/07 (5) One of my favourite reindeer, Nutkins, was just in the right place for this photo. The day was pretty drizzly with some sunny spells which made for excellent conditions for rainbows. 23/07 (6) Starsky’s antlers starting to grow. 24/07 A big yawn from spider! 25/07 (1) We were offering Starsky and Hutch supplementary milk two times a day just incase his mother, Lulu, was not producing enough milk for two calves. Hutch always turned his nose up to the milk but Starsky was too greedy to say no! 25/07 (2) For most of the summer we would take Starsky and Hutch out of the enclosure to find good grazing of heathers, blaeberry shrubs, birch leaves and lichen. The pair absolutely loved their daily trips outside! 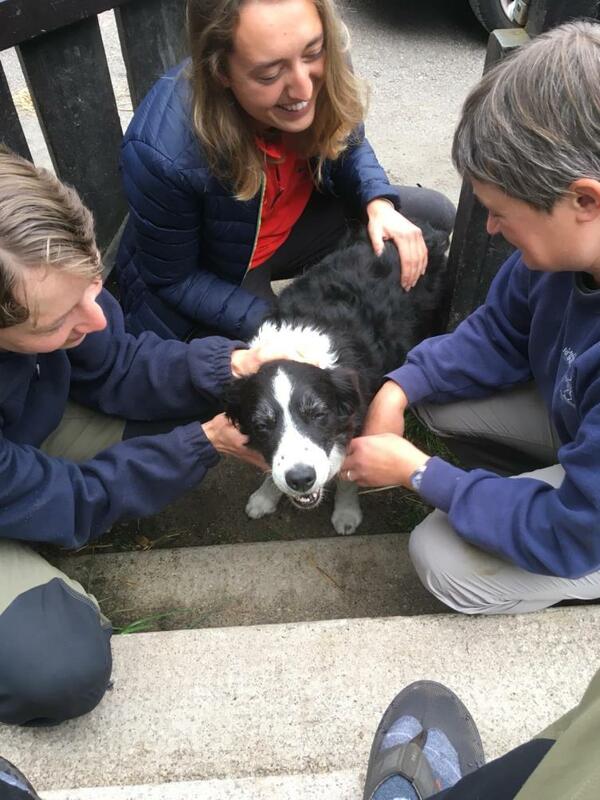 Since it was quite the internet sensation, we’re assuming most of you may have heard about the disappearance and relieving retrieving of Sookie, our in-house dog at the Reindeer Centre. Many people helped in the search by sharing our story, looking out for her, sending us tips and reports, and by offering us help in all kinds of other ways. With this blog we’ll give an overview of the timeline of Sookie’s wee adventure, and take the opportunity to thank everyone involved in the search! It was a nice Monday morning when one of Sookie’s favourite hill walk partners Mike pulled up in the driveway next to Reindeer House to collect her for a good day in the hills. He had planned to take Sookie up the munro Ben Lawers that day, which is a munro he’d walked before in his challenge to climb all of the munros. Once there they set off, near the summit of Beinn Ghlas, Sookie got a whiff of a smell of some kind of wildlife and took off. Mike, having walked Sookie many a day in the past, was not worried in any way, as she does so quite often but always returns shortly. This time however, it took a wee bit longer than usual for her to return..
After eating his lunch, waiting for her and calling for her for some time, Sookie still hadn’t returned. Mike decided to walk back to the carpark, hoping she’d be there, but unfortunately this was not the case. Mike climbed up the hill again, but still no Sookie. 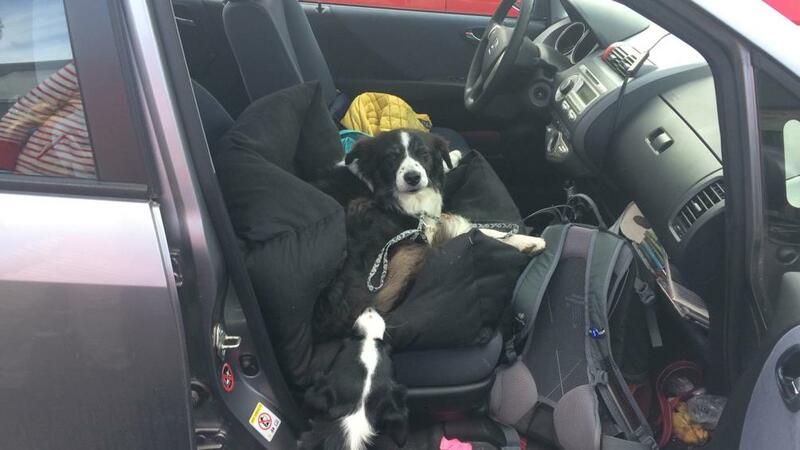 After it got too late to look for her, he stayed in his car overnight at the carpark, and we hoped she’d turn up the next day. Tuesday morning there was still no sign of Sookie, either at the carpark and or on the mountain itself. The next few days, different search parties consisting of herders, friends, and volunteers, went to the area and came back with no luck. On Wednesday, Robert McComb, an incredibly nice man who had contacted us via Facebook, made his way up from as far as Glasgow to help us out with a drone! Unfortunately it was too cloudy to be able to see a lot of the area with it. 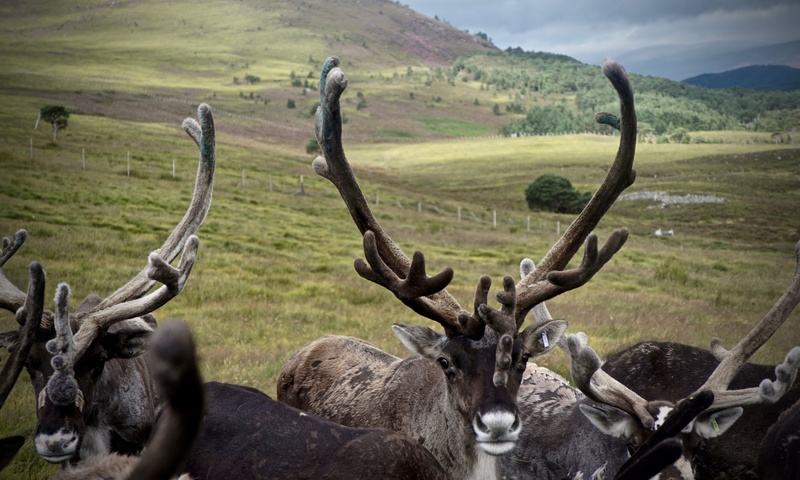 Then throughout Thursday, the Reindeer Centre got 4 calls from people who’d heard barks in the same area near Loch Tay. The people at the Centre marked off an area on the map according to these people’s reports and the search continued, along with other herding dog Tiree who might be able to lure Sookie out with her barks or find her by smelling her. While the barks were heard again, it was too dark and too far away to find her. 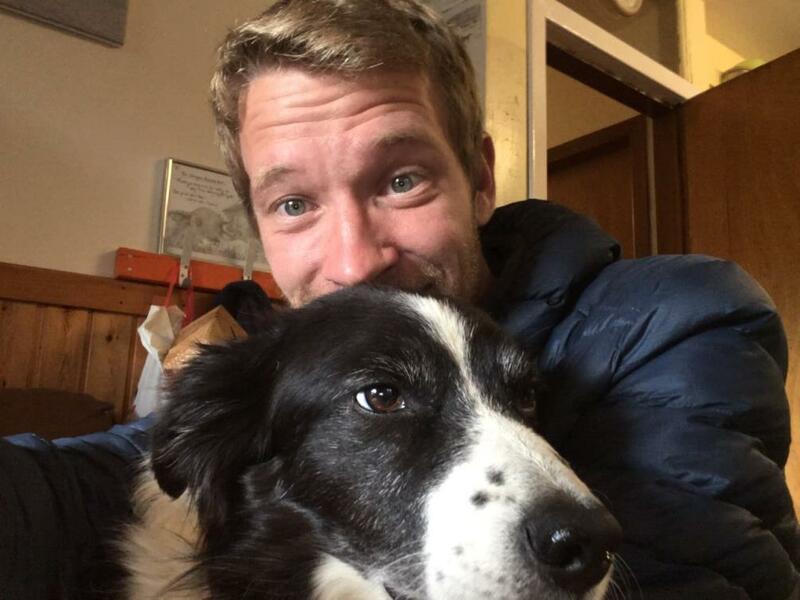 The next morning, Friday, which was already 4 days after she’d been last seen, the barking was heard again for some time, and eventually the Centre received a phone call from local ranger Andy. Sookie had turned herself in! Full of ticks, slightly underweight rather than covered in her usual bit of bodily winter reserves, and completely and utterly exhausted, was she returned to us. I was the lucky one to be in the area around that time, and had the delightful experience of driving her back to the Centre, where all the herders got quite emotional reuniting with her. Sookie’s doing well in her recovery. She’s slowly gaining weight and liveliness, and is certainly very happy to be back. We would like to thank everyone who has shared our Facebook posts, everyone who has offered to help us search for her, everyone who has wished us well, and everyone who has shown support in any other way. We were overwhelmed by all of your kindness. We would like to express special thanks to Andy, the ranger who contacted us and reunited us with Sookie, and to Dicky and Raina, the people who managed to hold on to Sookie after she’d shown up on their land, and who then contacted Andy. We’d also like to express thanks to Christine Parkinson, who offered me a place to stay on Thursday night to make the search easier, to Graham Jones who was out searching with his dog Mack and of course to Robert McComb, who helped out with the drone. 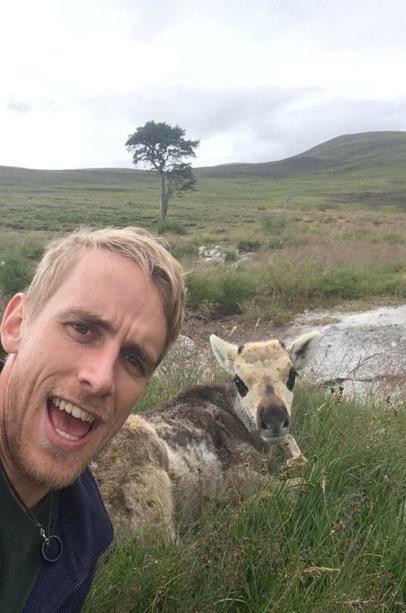 Happy selfie of Sookie and Jack, one of the ex-herders who made his way up to the Centre as soon as he could to cuddle Sookie till she couldn’t be cuddled anymore. 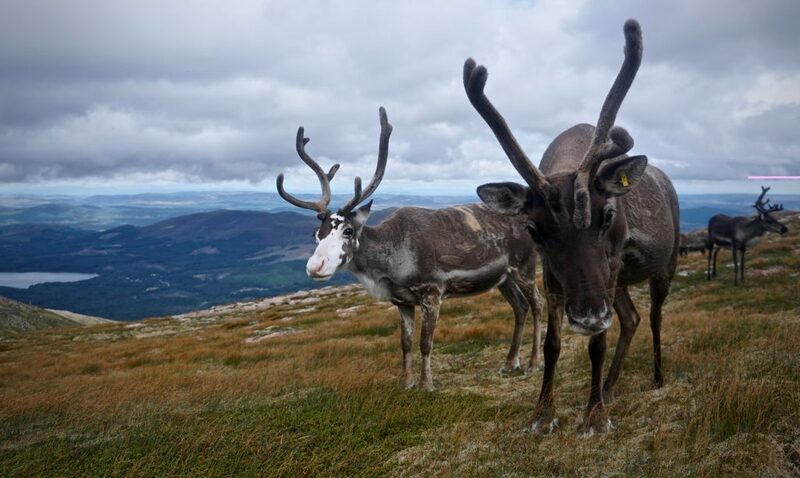 For part two of my Quirky reindeer feature, it’s the boys turn. Here’s a link to the girls in part one if you missed it last month. Mr Wonky Nose was born a little bit squint. From when he was a calf Boris has always had a slightly wonky nose. Apparently its from when he was growing in the womb he must have been pushed up against one side, only allowing the other side to grow normally. 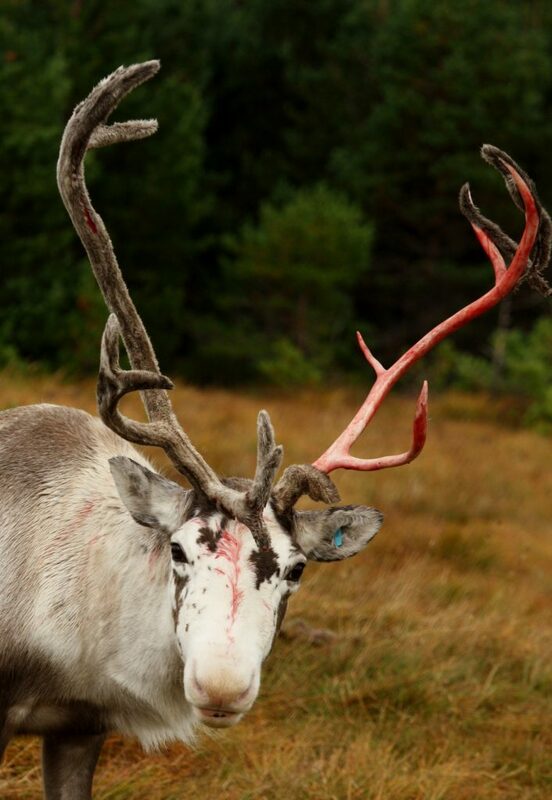 This has in no way affected him in a negative way, he’s just not the prettiest of reindeer. Though I know lots of people who would argue otherwise so I think in this case beauty is in the eye of the beholder! 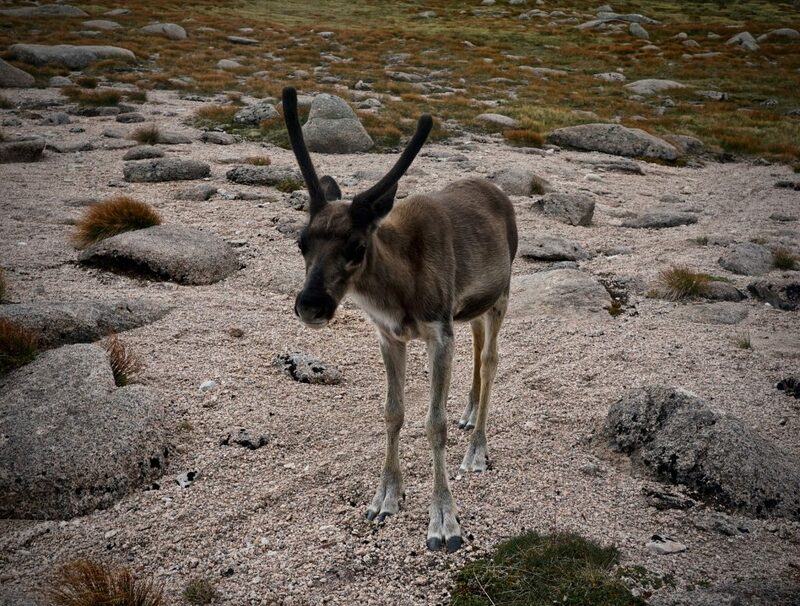 We have one other reindeer in the herd with a slightly wonky nose and his name is Addja. He joined us from Sweden in 2004 and is now the oldest male in the herd so this shows there is no negative implication. 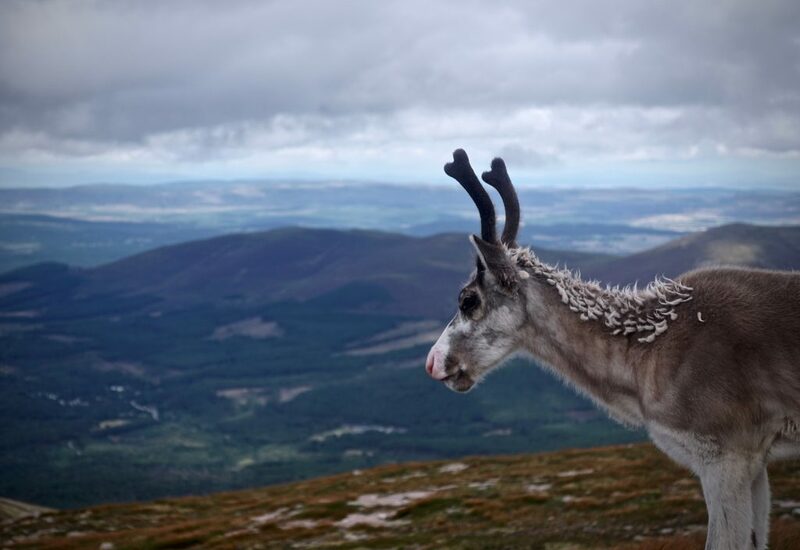 Where most of my ‘Quirky Reindeer’ stories are of reindeer who have been born with something different, Atlantic fits into this story from something that happened to him a few years ago. 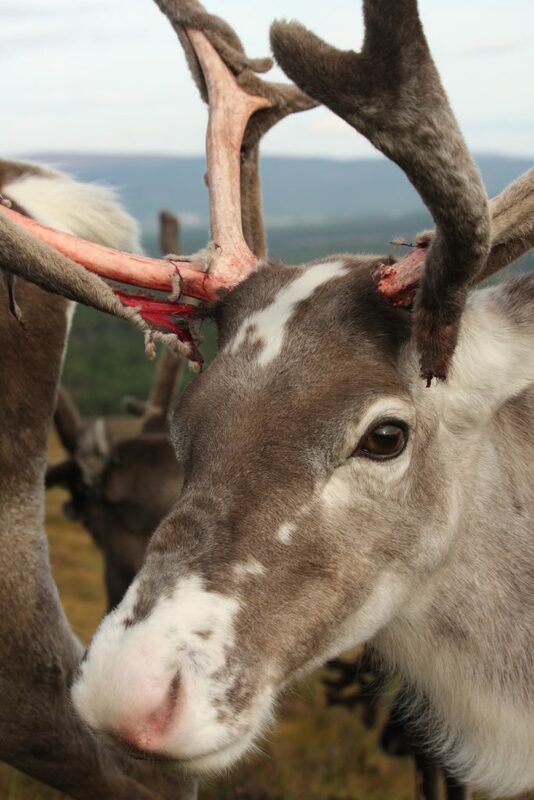 He has always been one of the biggest reindeer in his year, growing lovely antlers and always in fantastic condition. 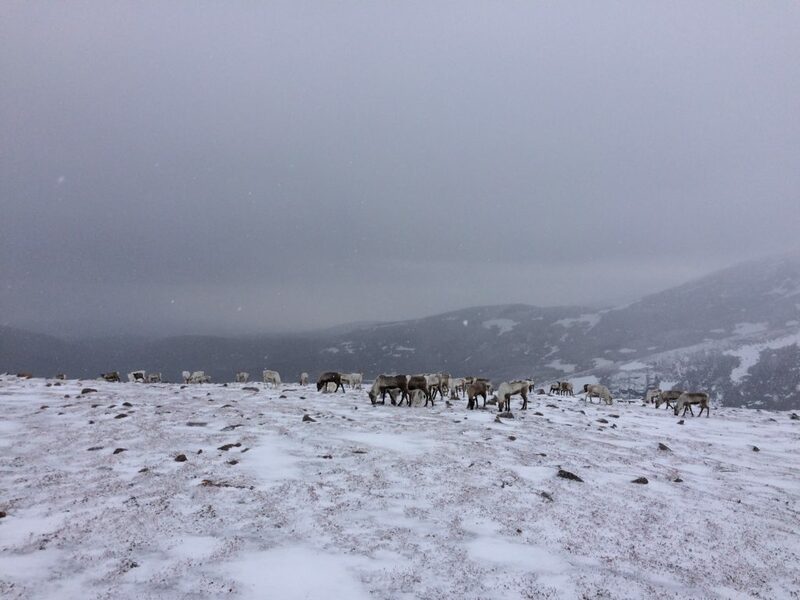 Two years ago, while out on the winter free range on the Cromdale Hills we were catching up and checking the herd and found Atlantic with a very sore foot. It was so sore he couldn’t put any weight on it at all and he was going around on three legs. We immediately took him off the hill to our farm to treat as we didn’t want to risk losing him out there. The vet came numerous times to check him over, we administered various different antibiotics and cleaned his foot trying to get rid of the infection, however, the infection was so bad and right up in the joint of his toe of one of his front hooves that nothing was working. Having done our best his foot still wasn’t getting better so our local vet suggested we remove his toe. He said he has done this on cattle before and being cloven hooved (two toes per foot) they get by fine with just one toe. So it was decided, we would remove one of Atlantics toes and he has never looked back. In 2017 he was one of our main breeding bulls and he remains one of the biggest in his year. It just shows how animals, and humans, can adapt to a new situation and their quality of life doesn’t need to change. 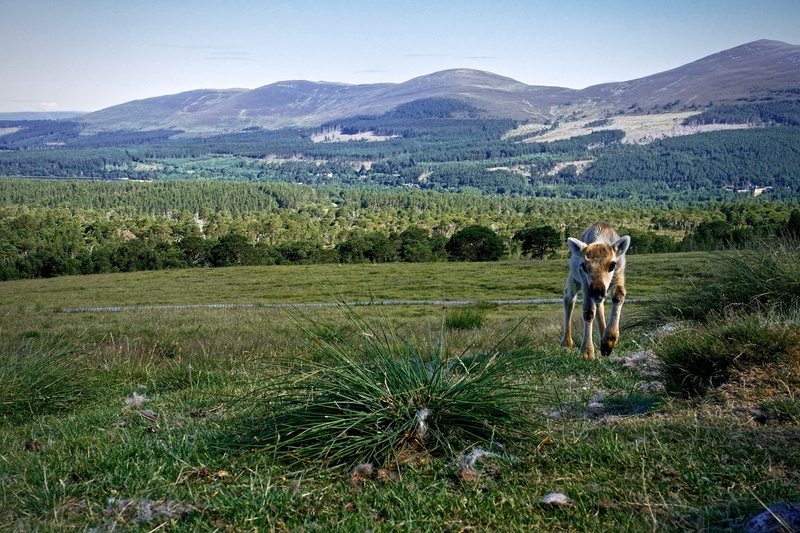 As a calf Merrick came back from free ranging on the Cairngorms with his mother, Nepal. 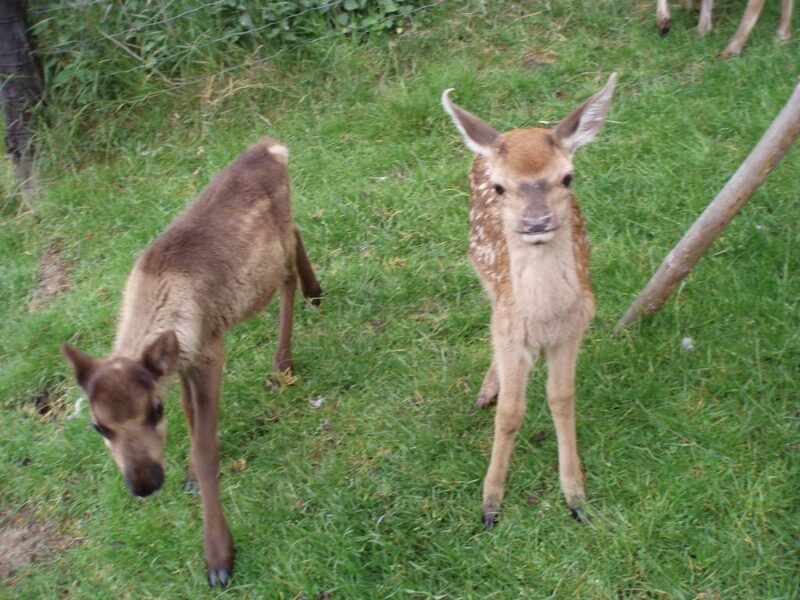 The calves only have very small antlers at that age and in Merricks case he only had a little stump on top of his head. 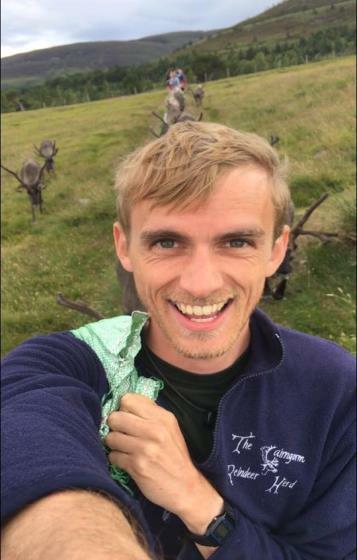 It wasn’t until a year later, when they grow their antlers between March and August that we realised Merrick’s quirk! He only grew one antler! 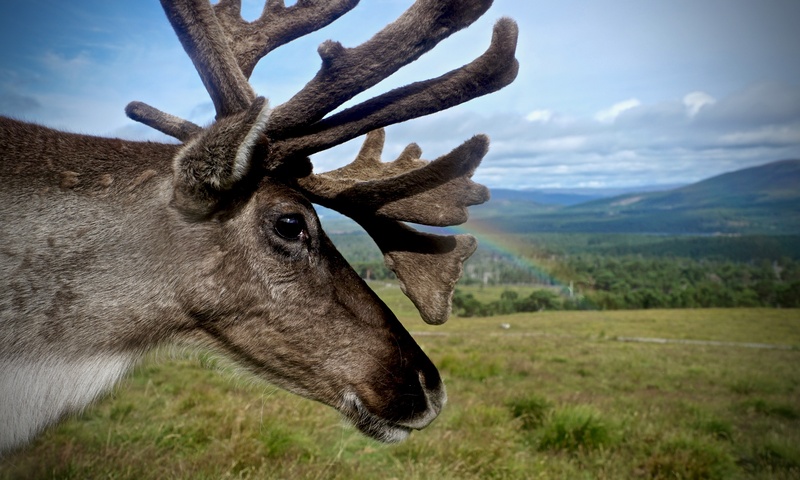 We have seen this before but only in female reindeer, never in the male reindeer. 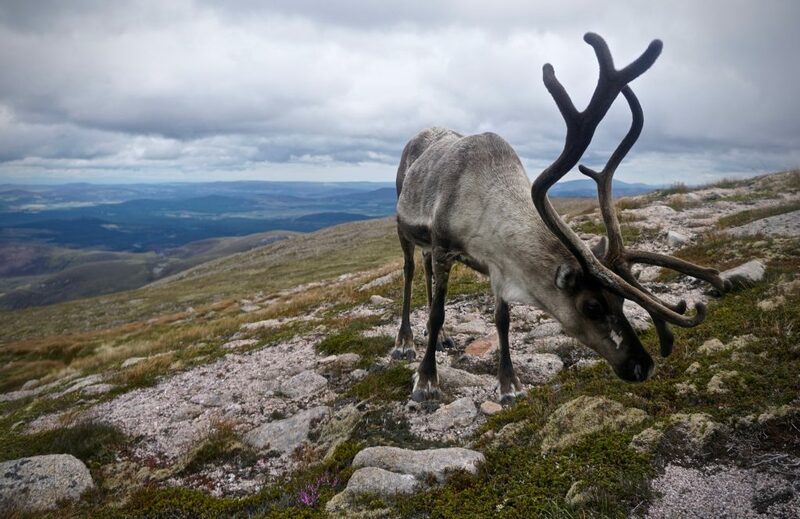 In fact Dixie a 12 year old female only grows one antler and also Brimick, a female reindeer the same age as Merrick only grows one antler as well as reindeer from the past – Ferrari, Cherry and Walnut. This is the first time we have seen this in a male and now he is 3 years old he looks rather silly just growing one antler. 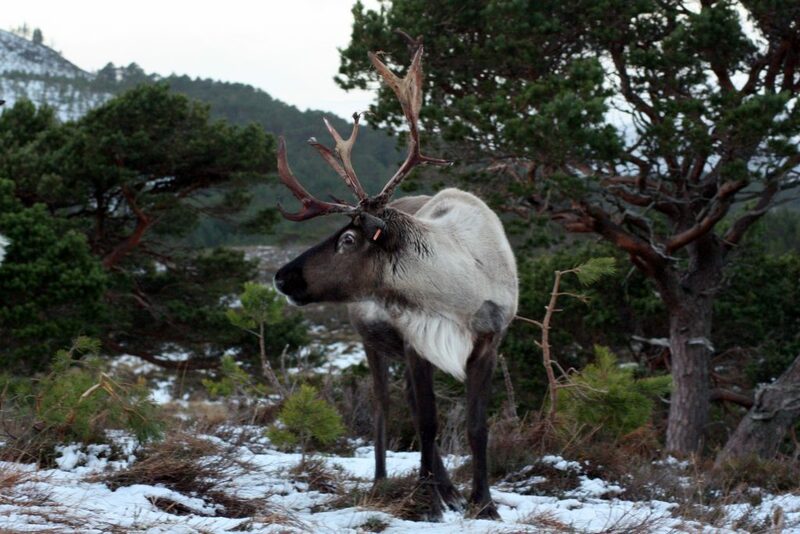 The female reindeer don’t grow antlers quite as big as the males so who knows what size it will get to. Will it only grow the same size as a normal antler or will the growth of two antlers go into the one… We have no idea?!?! Even though he grows just the one we still see him tapping the top of head where the other antler should grow so maybe one day, if he taps enough, he might grow another antler… Watch this space! 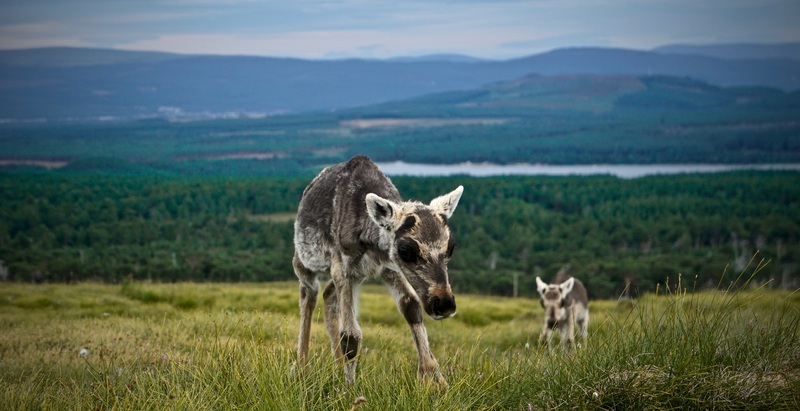 No doubt you will all know about the twins by now and how rare it is within reindeer to have twins. In May 2018 we had our first pair of surviving twins, Starsky and Hutch. Their mother, Lulu, was an older female and seemed to take them on no bother at all. Like human twins, although they looked quite similar their characters were completely different from one another – this isn’t something I can necessarily describe in writing but when us herders spend everyday with them and we get to know their characters inside out we can tell that the two of them were very different. 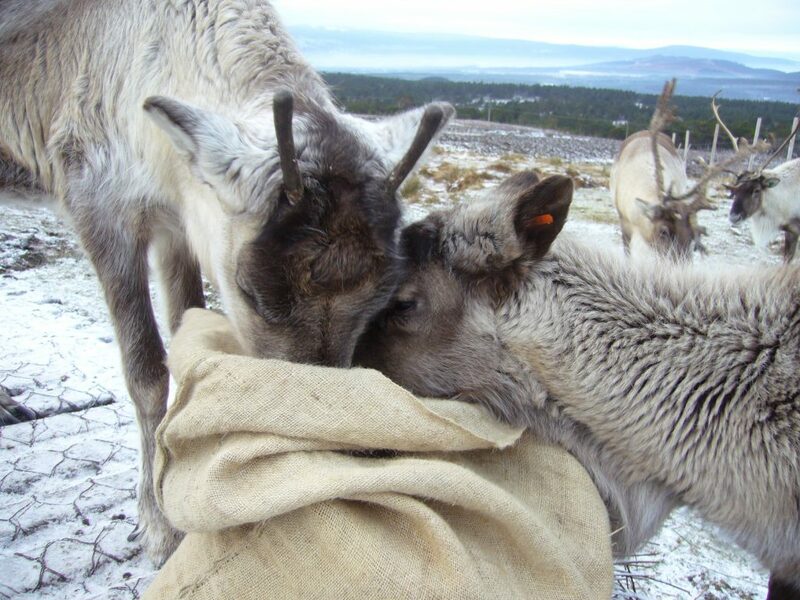 Sadly we didn’t get the many years of enjoying them together as we lost Hutch very recently, at 4 months old, but it was first for the Cairngorm Reindeer Herd and very rare in reindeer herds across the world. Our attention will now be focused on looking after Starsky. Antler stripping: A blog not for the faint of heart! I took photos with the purpose of writing this blog in September 2017, and then everything got too busy and I didn’t manage to actually write it. But here it is finally, so late that the subject matter has effectively come back into fashion once again! All the photos below are from last year (or earlier), rather than this year however. 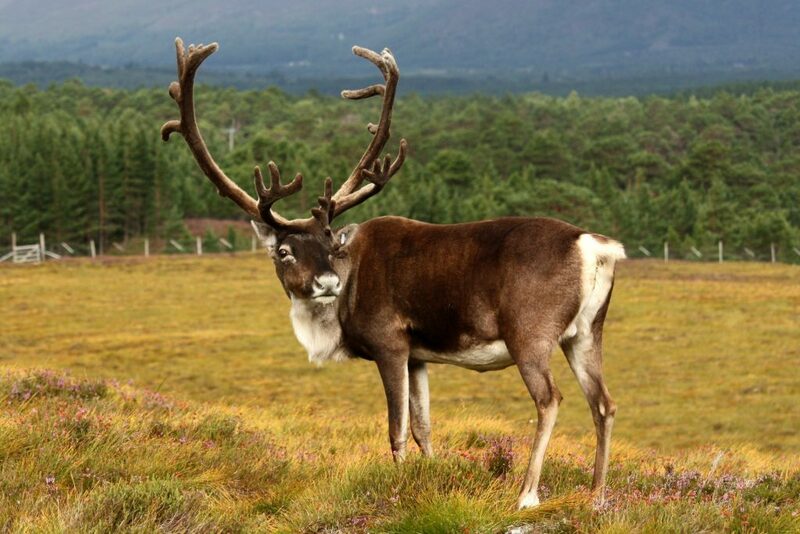 Reindeer antler is made of bone, and bone needs a blood supply for it to grow. 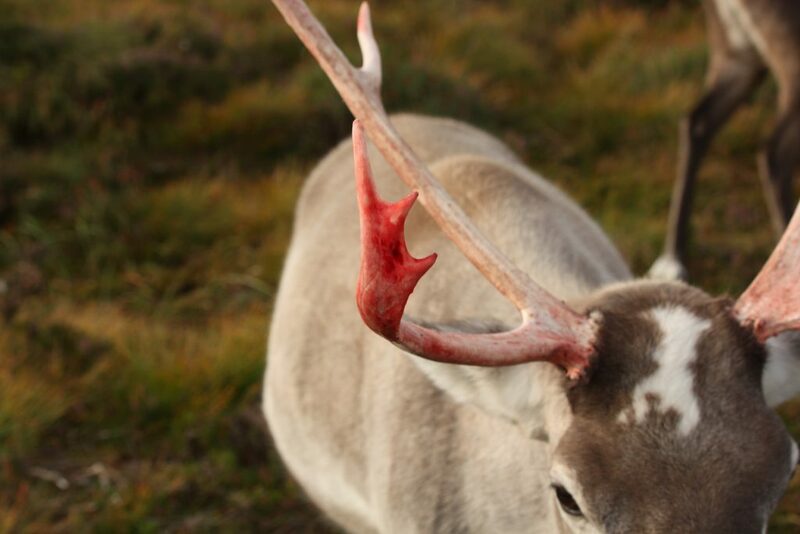 Antlers start growing in the spring and at this point the soft, growing bone is covered with a layer of ‘velvet’ – a thin, hair-covered skin which is full of blood vessels and nerves. 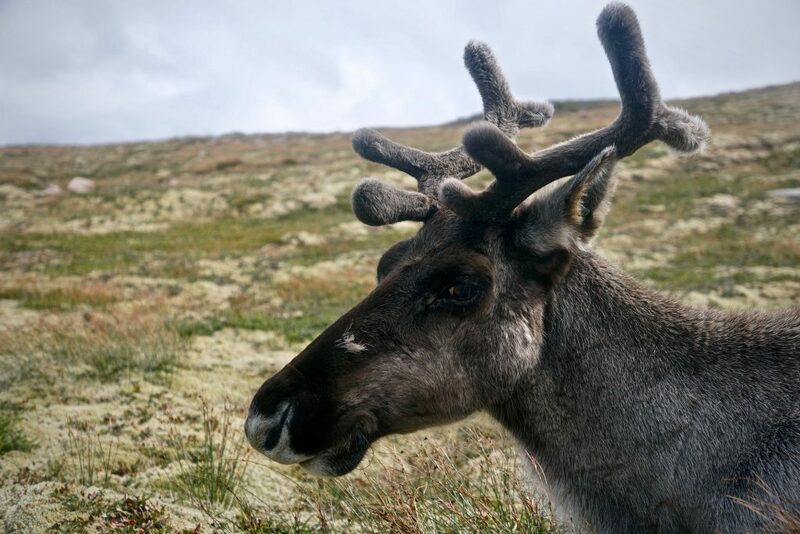 Late August and September are the months when reindeer finish growing their antlers each year, the bone hardens up, and then the ‘velvet’ skin strips away. Now, this can be a bit of a gory affair if you don’t know what to expect, so read on with caution if inclined to be a little squeamish. Although depending on what size of computer or phone screen you’re reading this on… it might be too late already. Sorry. 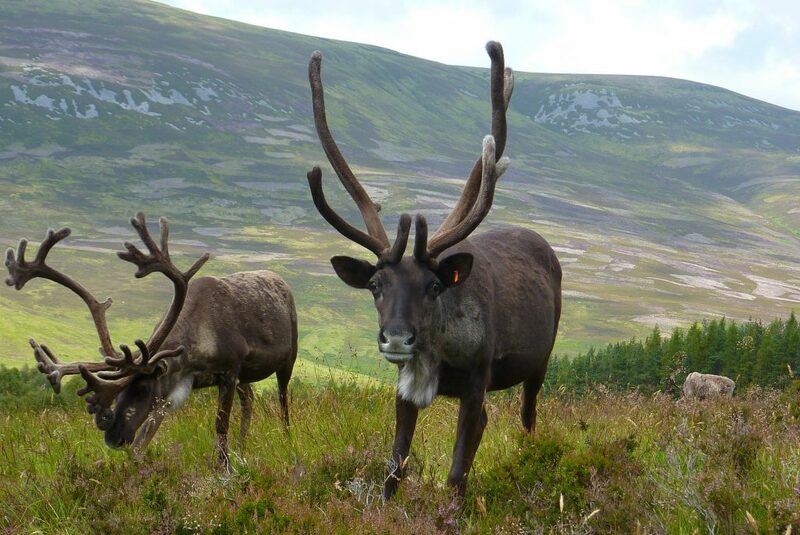 The first reindeer to ‘strip’ their velvet each year are the mature bulls, starting at the end of August. They are followed but the younger bulls in early September, and then the cows will strips their throughout the rest of September and into October. 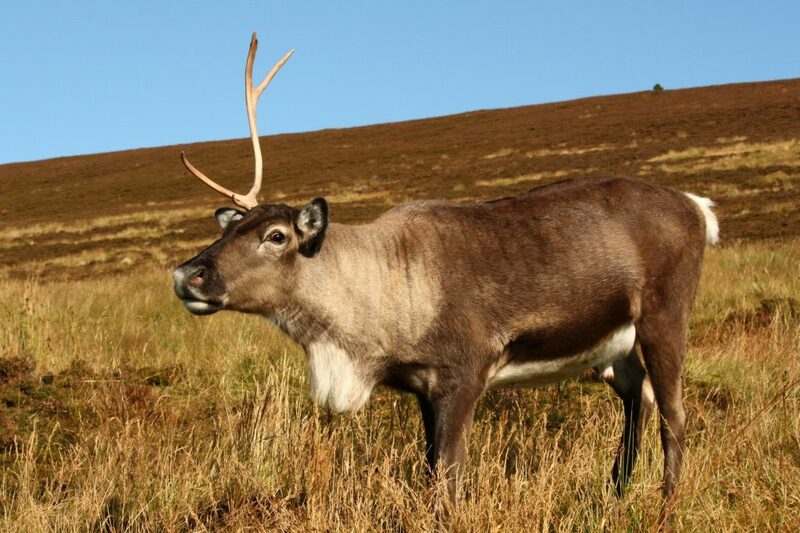 The castrated males, or ‘Christmas reindeer’ as we call them, are slightly different as they no longer have a hormonal trigger to strip the velvet away as their hormone balance has changed. They do still strip their velvet, but slowly and over the course of months as opposed to the space of a couple of days. Clean but bloody antlers. Rain is needed! 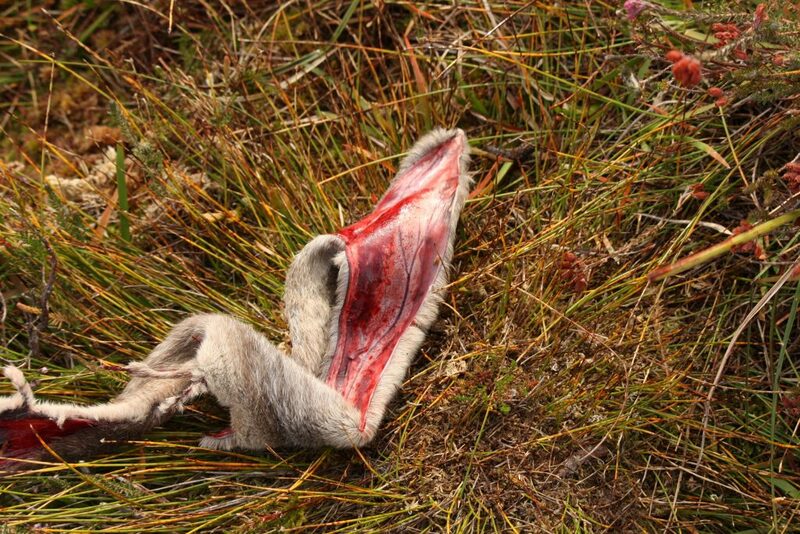 Although the blood supply to the velvet has cut off, there is still residual blood remaining in the blood vessels of the velvet, so stripping can be a gruesome affair at times. 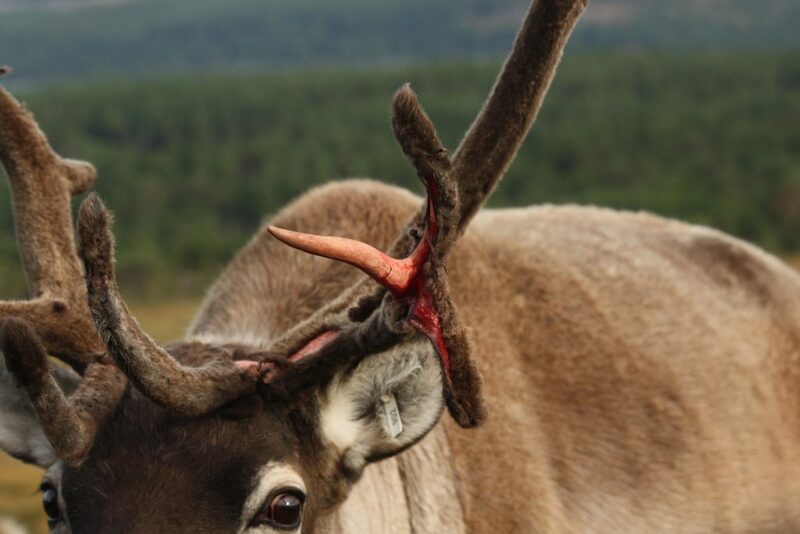 There is no feeling left in the antlers by this point however so it is completely painless, and this is a fact we have to drum into to all visitors before they come face to face with a reindeer whose skin appears to be falling off! It’s not a good look. But for those visitors who are feeling brave, I take great delight in showing them a section of freshly stripped velvet as the blood vessels are visible, making it easier to explain the process of the antler’s growth. I find kids are generally well impressed and want to poke at the bloody skin, whereas adults are often a little grossed-out and not keen to touch! 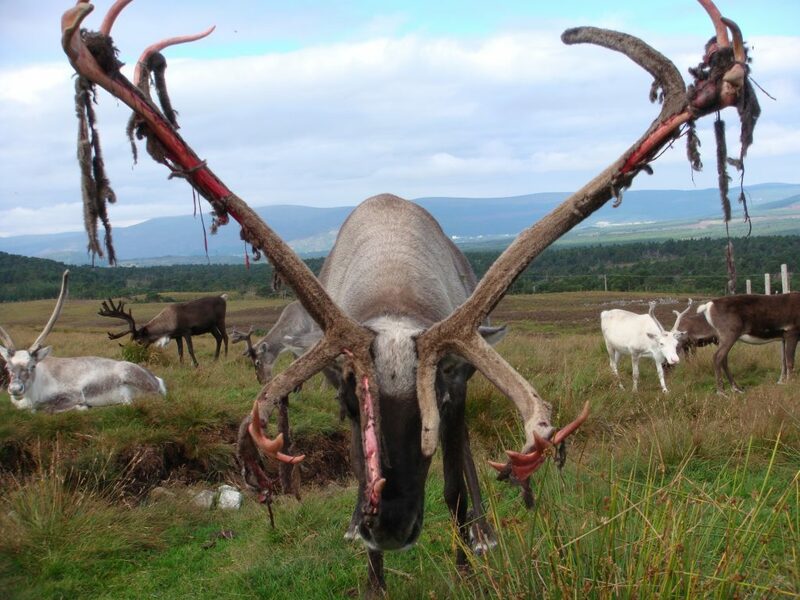 Once the antlers are clean of velvet, they tend to be a bit red-tinted from the blood until there’s been a rain shower, and then they are a more normal, ‘bone’ colour. And then it’s time for all hell to break loose, as the young bulls start squaring up to each other and the big bulls have to be separated from the herd for the safety of the visitors each day, until they can be split up and moved to closed off sections of the hill enclosure with a group of females apiece. The rut has arrived! 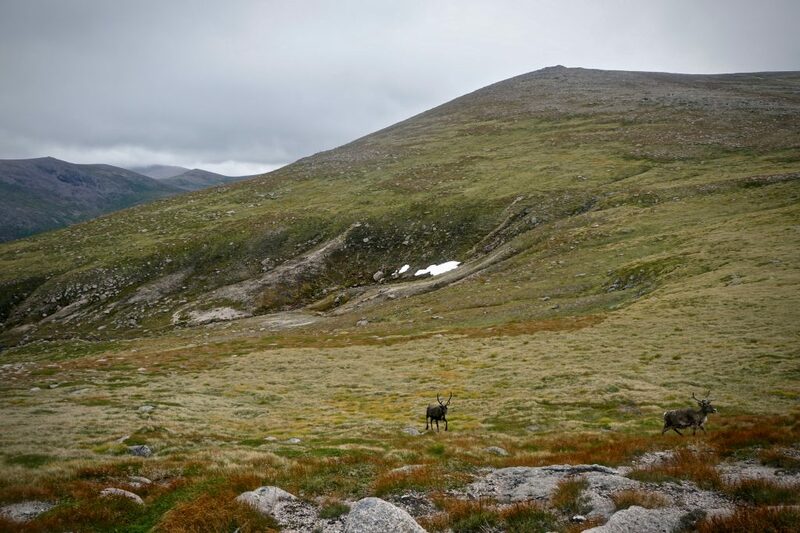 At the start of August, Lottie and myself were sent out into the mountains to see if we could find the free-ranging females and their calves. Fiona had spied a big herd from the road and thought it would be a good idea to get them to follow us for as long as possible with a bag of food, in preparation for the rutting season where the females will need to be led back into the enclosure. 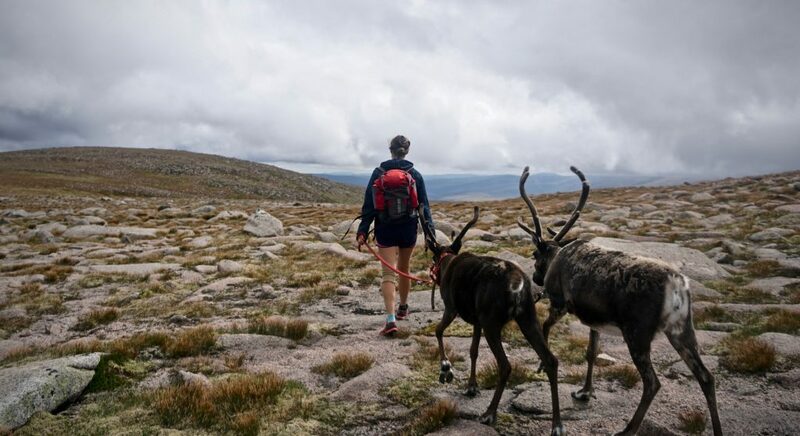 With our lunches packed and a bag of feed each in our rucksacks, Lottie and myself set off for a day searching for reindeer. Lottie leading Hopscotch and her daughter Kipling, probably the greediest pair of females ever in the herd! The herd is following behind. At the Ptarmigan restaurant, at the top of the funicular train line, we were rewarded with the sight of a large group of 20 females and two calves. Three females immediately ran over as soon as they caught sight of us removing a feed bag from Lottie’s rucksack. These turned out to be Hopscotch and her yearling Kipling. Hopscotch’s three-year-old son, Kips, is a regular on the handfeed line on hill trips and it was easy to see where he had inherited his greediness from! 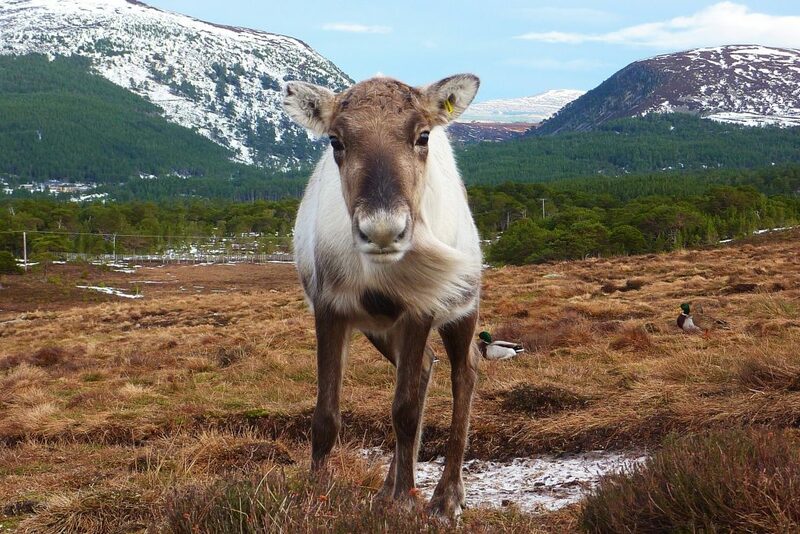 The third was a little reindeer called Pagan who proceed to half-heartedly shake her antlers on our legs in an effort to receive some food. After spending lots of time with the twins, I was surprised to see how big the calves were on the free-range. 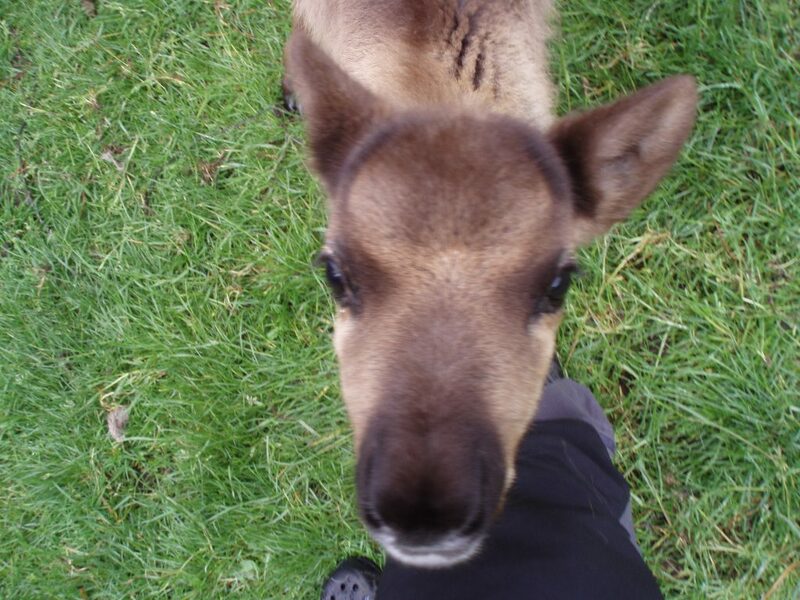 Look at the size of the antlers on this calf! With Lottie leading and myself following at the back, we managed keep the females as a group and walking for a good half hour around the plateau. We gave up when the herd started to trot off in all directions and no amount of running behind in zigzags would keep them together. We had just made the decision to put the feed out, when Lottie looked behind and discovered another large group of twentyish females had joined us! After putting a long line of food, we counted 43 reindeer in total. 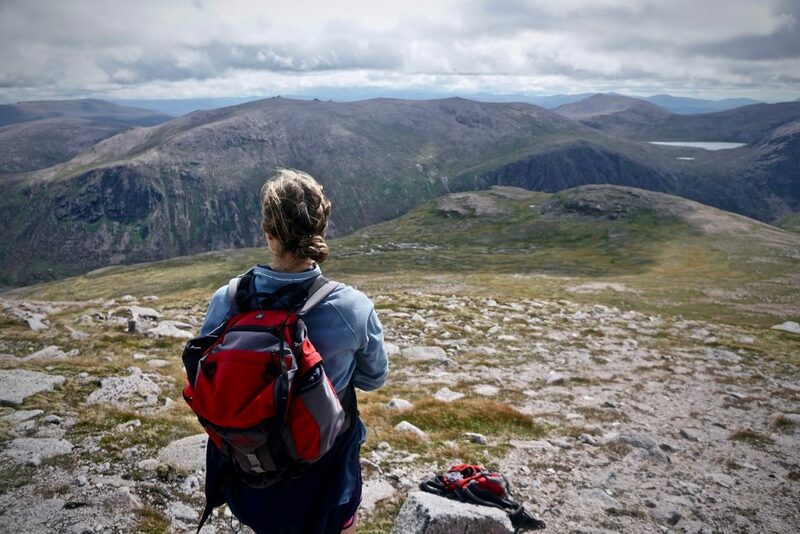 Morven looking beautiful against an amazing view over the Cairngorms. 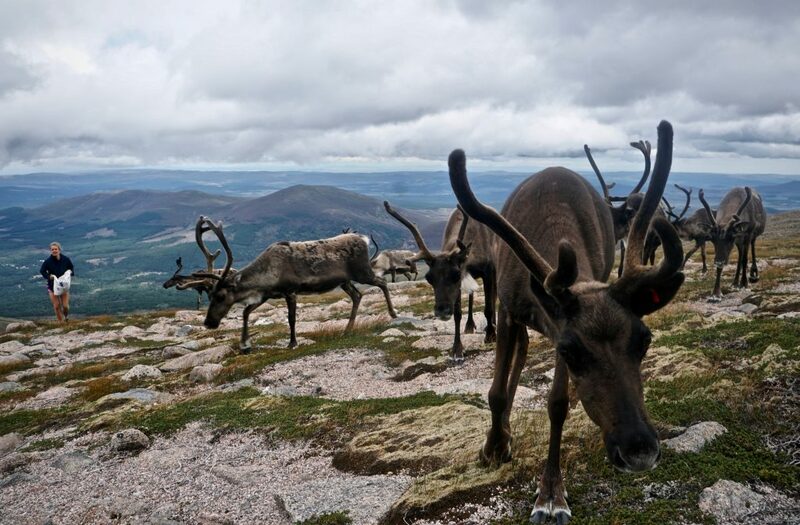 Once everyone was fed (including ourselves), the reindeer trotted off as one big herd, moving quickly across the mountain which was amazing to watch. Lottie and myself then headed to the summit of Cairn Gorm and around the Northern Corries in the hope of finding another group. Unfortunately, we spent the rest of the day searching for reindeer to no avail. We did however, have the most amazing day walking around the mountains, in shock the whole way that we were getting paid for this! I often have people telling me on hill trips that I have the best job in the world, and after this day out in the mountains, I would find it hard to disagree with them. Three became separated from the herd but after a few minutes of calling them, they ran straight back over, not wanting to miss out on their lunch. There is still a bit of snow left over in the Cairngorms, even after the summer heat-wave, which we can see in the middle of this photo. All of the herd following Lottie and her white feedbag. I was walking behind making sure they kept moving forwards. Hopper has amazing antlers this year! My first time meeting Fly. Her antlers were incredible with one side towering over the other. Apparently she lost one of her antlers a lot later than the other, causing the missmatching in their size. Look at the size of Fly’s antlers in comparison to Okapi (who has fairly large antlers for a female)! Kipling running over to see if I have any food! Gloriana hasn’t yet moulted her winter coat on her ears so they are still really fluffy! Running for the feed line. Brie curious about my camera and Cheer behind looking beautiful. Lottie and myself couldn’t believe how cute this calf was with his winter coat still on his neck in little clumps. Lottie looking down towards Loch Avon from the side of Cairn Gorm. 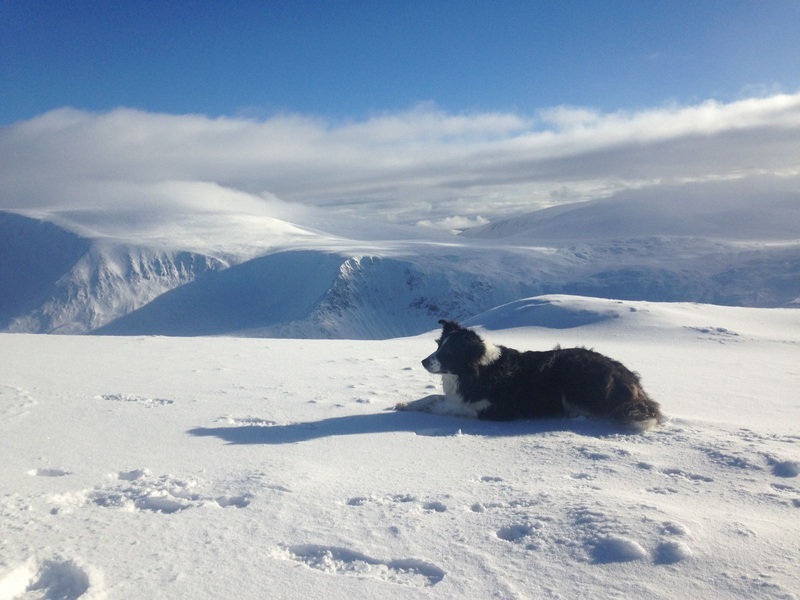 Lottie and the Northern Corries. 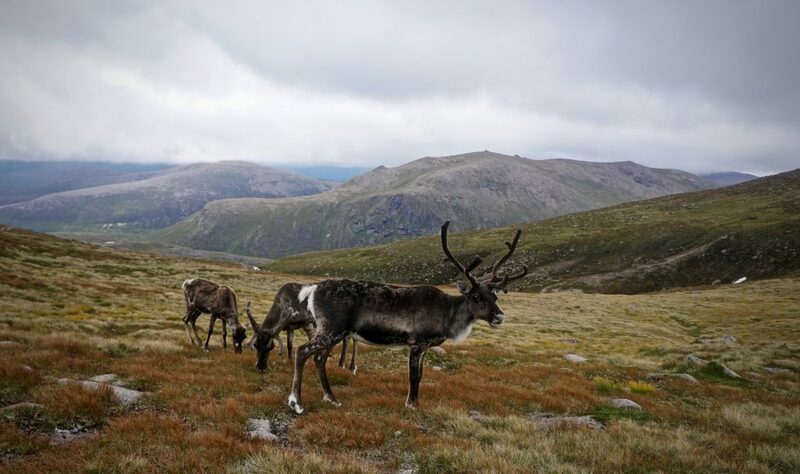 We didn’t find any reindeer from this point but had the most amazing walk along the ridge of the Corries and back down to the car park. I remember the day Grunter was born. Dixie, his mum was only two years old at the time and rather than taking herself away from the herd to find a nice wee spot to calve she stuck with them and joined in with our daily guided tour. Things all happened very fast for her and before she knew it, mid hand feeding time for our visitors, Dixie popped out a tiny wee bundle which was Grunter! Much to her surprise she really didn’t know what to do next, instinct didn’t kick in and she legged it off up the hill in panic. Sally and Kathleen were on the visit that day so they reported down for a contingent of herders to come onto the hill to help out. Alex and Emily first came up to help out getting Dixie back and taking herself and Grunter (who wasn’t actually named at this point) back to our shed and penned area on the hill. I then joined them to help get Grunter to suckle as it is very important for them to get their first milk which is the colostrums. This plays an vital part in their immune system at the very beginning but also for the rest of their life! Dixie was extremely unsettled and actively using her feet to shoo Grunter away from her so we had to use a bit of brute force as Grunter needed to get the milk. We also supplemented with some formula from the vet, just in case he didn’t get a full quota. For the next few days we didn’t want to keep them separate in case there was a small chance Dixie would take to having a calf. We left the two of them up in the penned and shed area for a few days but also went up early mornings and late nights to give Grunter a bottle of milk. It was at this point he got his name as Sally and I were walking up towards their pen one morning and the demanding sound of ‘grunt… grunt… grunt’ was echoing. It was a nickname which of course stuck, as most nicknames do with the reindeer. It became very apparent over the next few days and weeks that Dixie was not going take on Grunter so we decided it was best for her to head for the summer free range with the other cows and calves and we would hand rear the wee man ourselves. Another few days passed and then we sadly lost a female called Maisie who had a female calve of 10 days old so now we had two! Its unusual enough having one, let alone two to hand rear in one year, we were left well and truly holding the babies… We named her Hippo as she was as hungry as a hippo when it came to giving them their bottle of milk. The two of them were thick as thieves however it was definitely Hippo leading Grunter astray, he would follow along like a lost little brother. Everyday they would go up and down the hill with us spending the day up there and then back down to our paddocks here at the Centre at night. 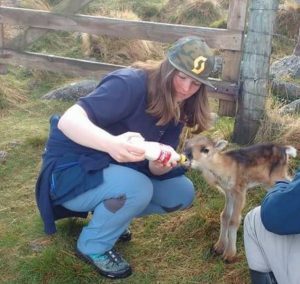 Not only did we have two reindeer to hand rear but we also ended up with two red deer (from our Glenlivet farm) to bottle feed so it was a right wee crèche out there. Still not too big for Fiona to pick up though! As always they grow up far too fast but it was such a great summer with them. They were full of fun and mischief. Usually reindeer wean off the bottle of milk round October time but Grunter (not Hippo) was very much still enjoying his bottles of milk right into December and even had them while out and about on Christmas events. As a teenager Grunter was a bit of a handful as he loved jumping on people. 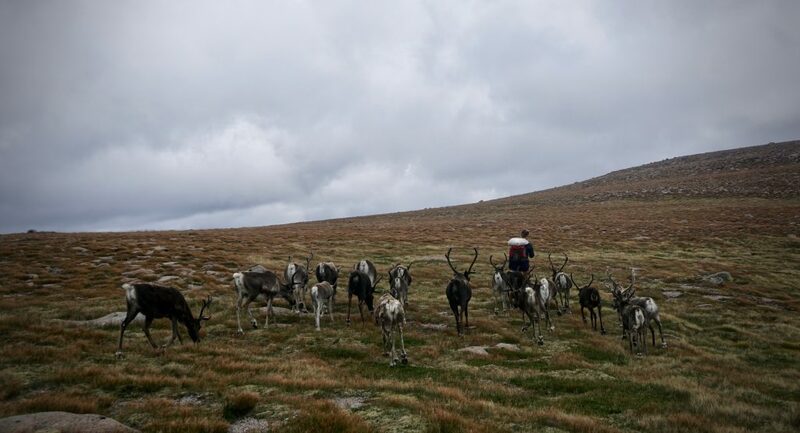 He has managed to include most of us reindeer herders in that too. Reindeer herder Anna will remember Grunters hooves reaching her shoulders in the paddocks and I remember once I was calling the reindeer down and Grunter decided that was his time to pounce (literally) therefore during those younger years Grunter was sent to the farm for the summer months where he couldn’t pick on the general public… or reindeer herders! 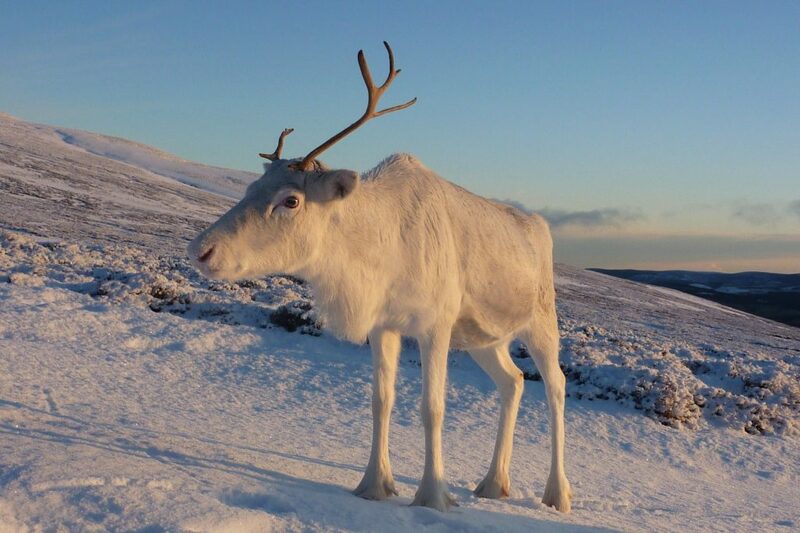 However he did mellow when he got to about 3-4 years old and he turned into the most amazing reindeer – he didn’t have a malicious bone in his body. When out on Christmas tour I have taken him into old peoples homes and children’s hospitals where patients have been bed bound. The delighted on their faces to meet Grunter was priceless. We went to visit my Grandpa when he was fairly frail at his home on the south east coast and we got Grunter right in his conservatory to meet and greet, needless to say my grandpa was delighted! I have had very young children lead him around as he is totally trust worthy. 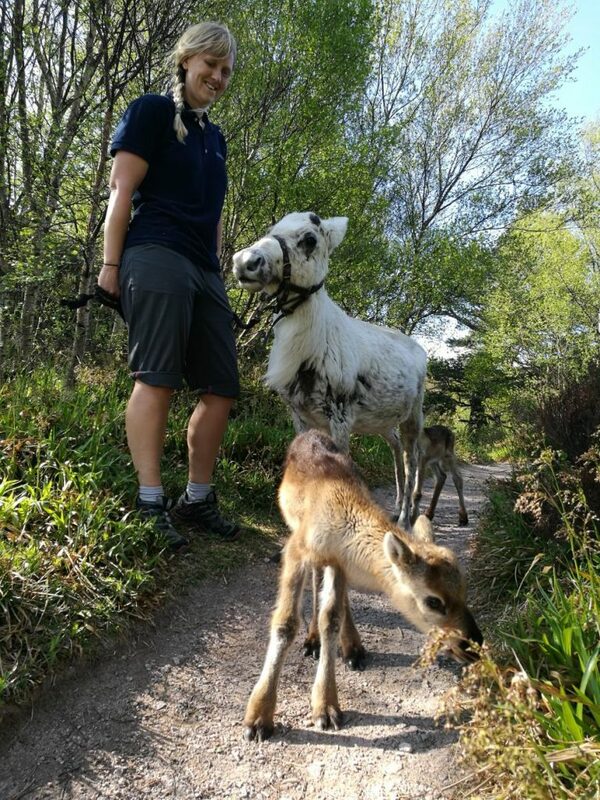 Candice and Pandra (long term supporters of the herd) will have fond memories of Grunter on tour, I think he was a bit of a guardian in the pen when little Pandra would walk round, the other reindeer wouldn’t give her a hard time if Grunter was by her side. 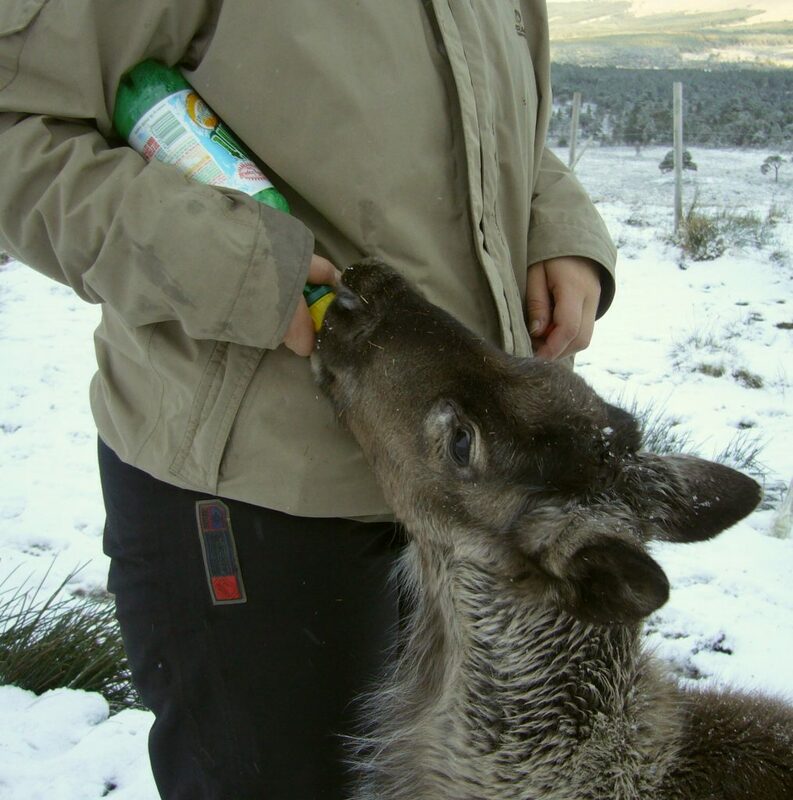 That was the only slightly naughty thing about Grunter, he was so tame and used to humans that he didn’t think twice about giving the other reindeer a bit of a hard time… or was it keeping them in check within the herd, not sure. When we stopped at service stations to fill with fuel Grunter would make himself known by ‘grunting’ to seek a bit of attention, which lets face it if he was in my team he always got… I did spoil him rotten! 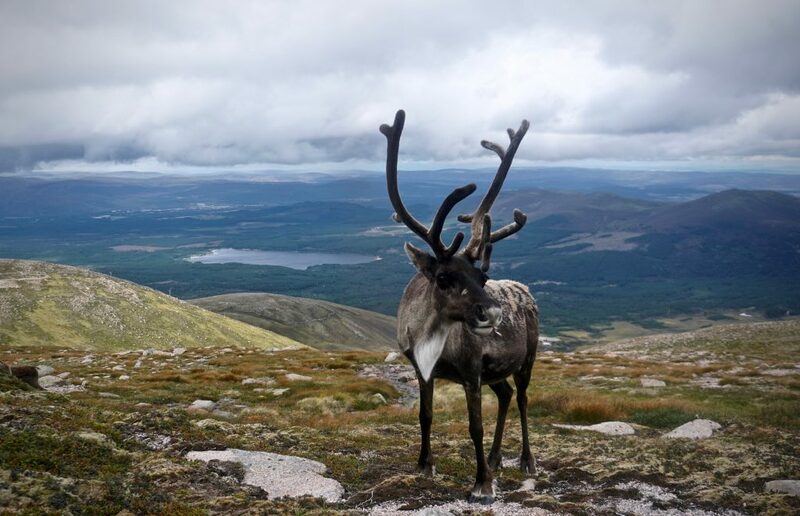 When back at home he was always used as a role model, whether it be training new reindeer to pull the sleigh, to lead the herd in or moving them round on the hill side. 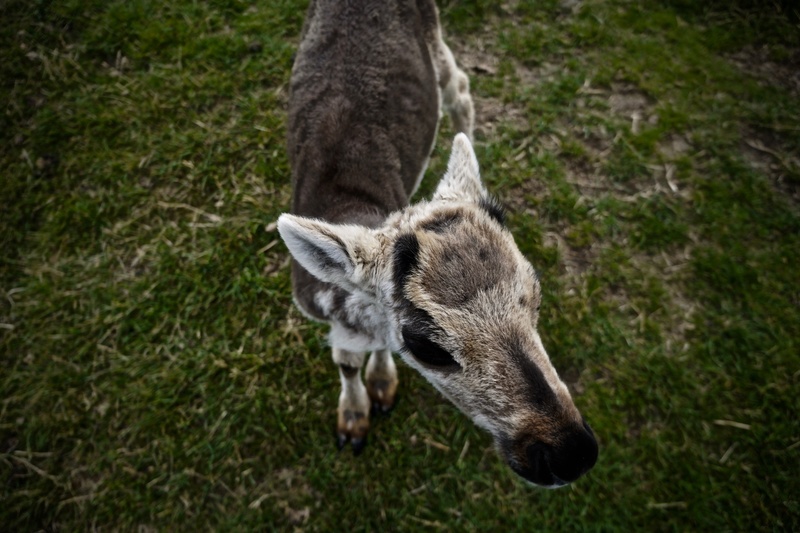 When loading into the livestock truck Grunter wouldn’t even break his stride to go up the ramp which showed how comfortable he was and gave the younger inexperienced reindeer comfort in travelling. He definitely had a cheeky side though and sometimes when pushing the herd in Grunter would leap around dancing and refusing to go through gate ways… he was playing like a naughty child and avoiding doing what we wanted him to do because he knew us so well. Grunter died almost exactly eight years to the day after he was born. 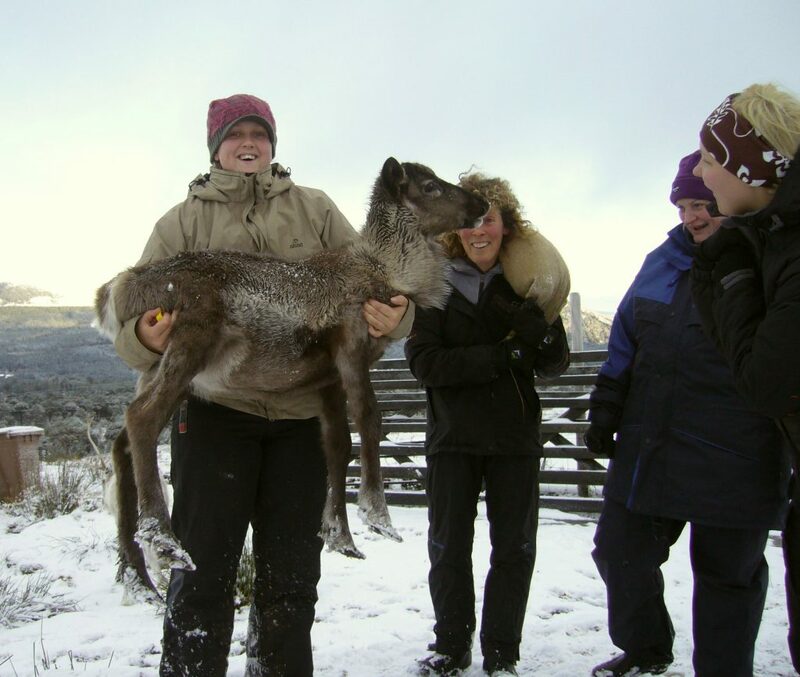 He was over at our hill farm having spent the winter free ranging on the Cromdale Hills. Over the past year he hasn’t seemed to put on weight quite as much as we liked however spirits were always high. His last night with us Tilly shut him in so he could get a good pile of lichen to himself and as she left she just push the gate to, not latching it shut. In true Grunter style he finished up the yummy stuff and then pushed his way out the pen. He headed to the top of the hill beside a birch woodland and that’s where he died. Tilly found him in the morning so we buried him up there in the woodland with a good view of the Cromdale Hills. We suspect his shortened life may have been from not getting the best start to life in the first place and maybe not having as strong an immune system, but this is just speculation, maybe he had something underlying that we didn’t find. The main thing was he was never in pain or horrifically ill, he was the same old Grunter from beginning to end. 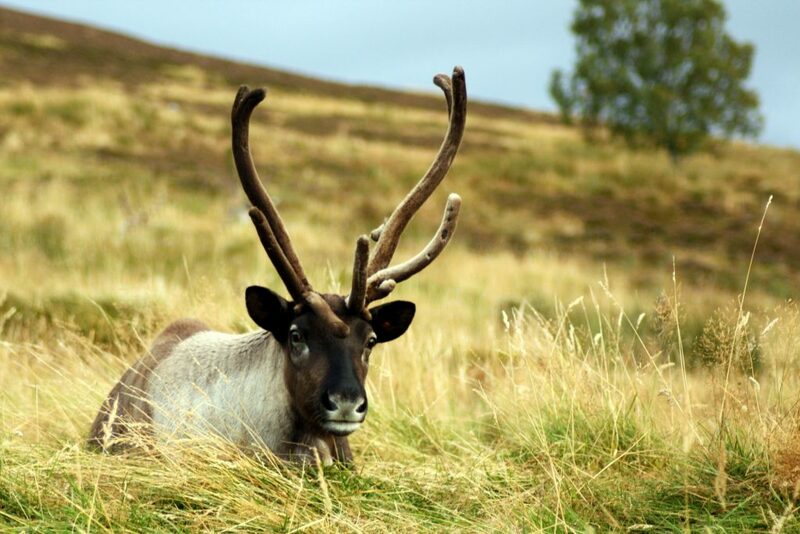 Reindeer like Grunter are rare and he has no doubt crossed paths with many of you whether it be here at home in the Highlands of Scotland, out and about on Christmas tour, or both! 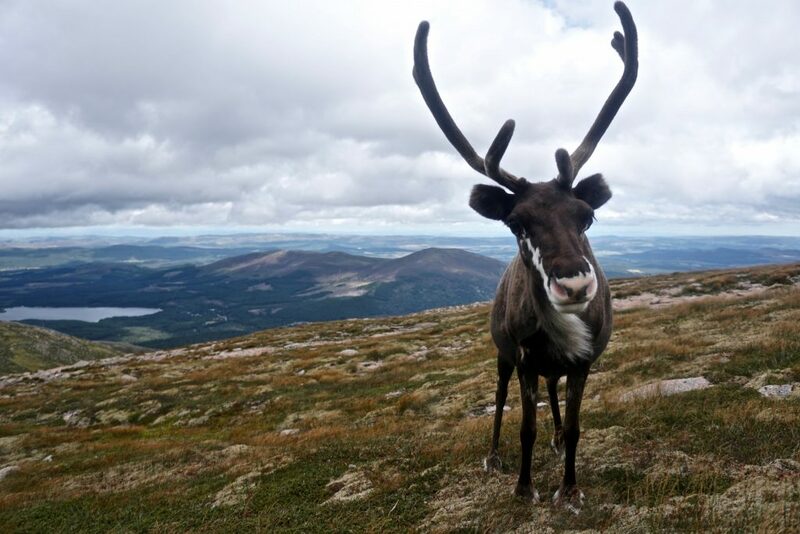 Feel free to write your story / memory of Grunter and lets share the antics of this amazing reindeer! Four years. That’s how long it’s been since I had my first stint as a ‘Reindeer Herder’. It is a job title that has raised many curious eyebrows in subsequent job interviews. “No it’s not a typo, it really did happen” is a sentence I have found myself saying all too often. Those four years have been spent living in big cities, first Sydney and now North London, where in September I will resume my final year of study as a Physiotherapist. 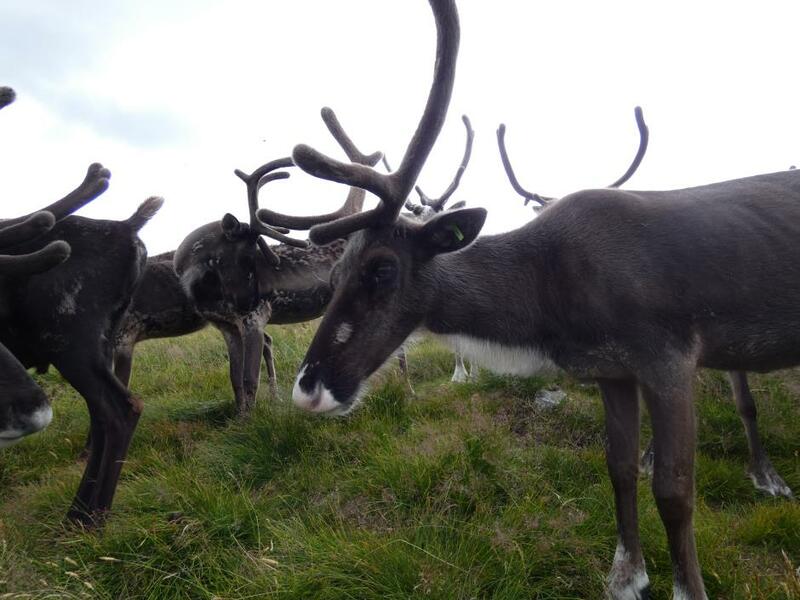 Hen pointed out that I only seem to come up to work at the Reindeer centre when there is a football World Cup taking place. And amongst the changes here since 2014, is the amount of herders who would watch the matches with me (and not all of them would be supporting “the team playing against England”). 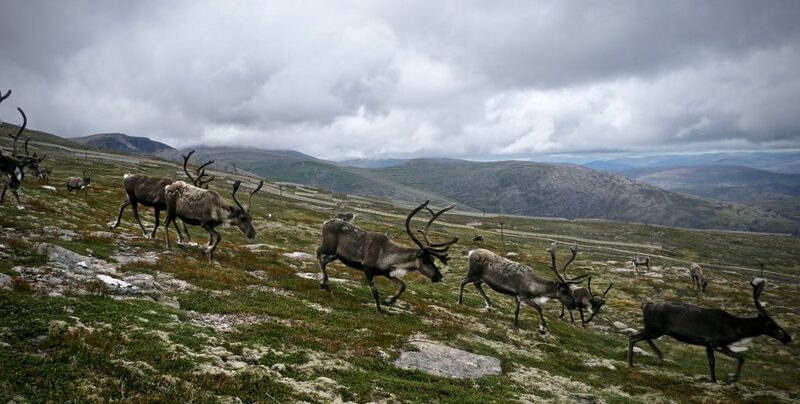 The majestic and dramatic mountain range appears to have remained the same, as has the gentle and charming nature of the Reindeer. ‘Strange’ is the word I would use to describe seeing the yellow tags (cheeses) as grown-ups, having known them only as calves in 2014. 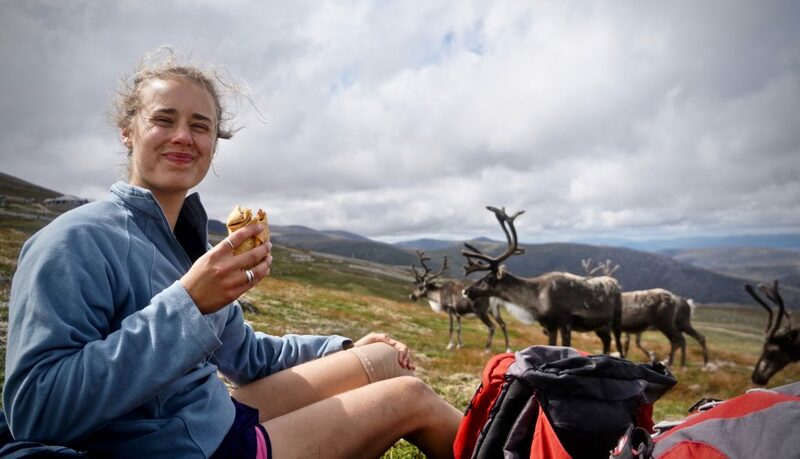 But no words can describe the depth of positive feelings which I get from being up in this part of the world, surrounded by friendly and fun human-beings, as well as the delightfully mischievous Reindeer. Even when I can’t scrub the smell of Reindeer food off of my hands, or I am bitten by my hundredth midgie of the day, I have a lot of gratitude to be up in such a beautiful part of the world. One feeling that I had forgotten is the feeling of blissful exhaustion. 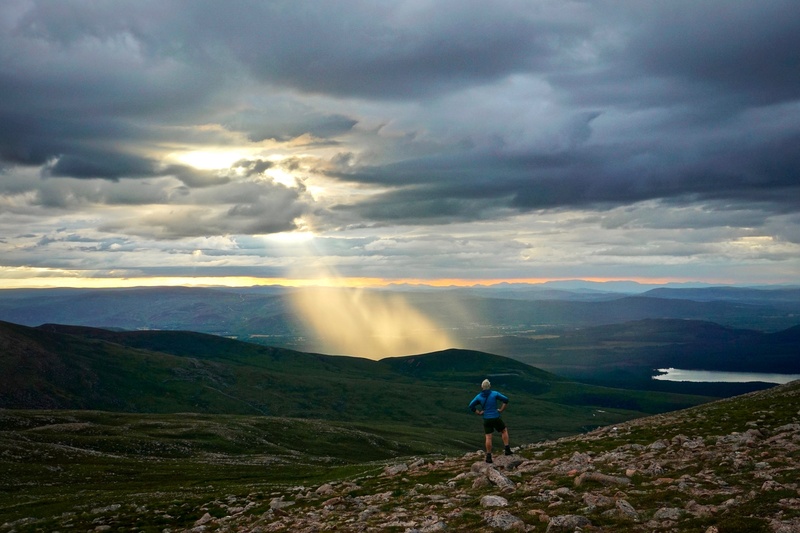 After a day of herding, there are so many fun things to do in the evening such as sport, wild swimming and fell-running that it’s hard for the body to keep up. But with FOMO (fear of missing out) imbedded into my brain, the body is finding a way to adapt from sedentary study days to keeping up with shenanigans and I recently attended my first ever Ceilidh (a night of traditional Scottish dancing) where I had a whale of a time. 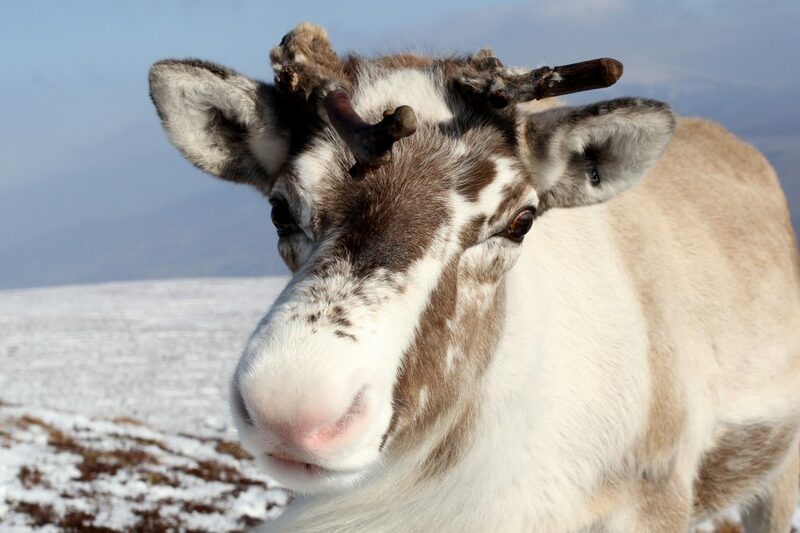 I hope to see you on a tour sometime and share the pleasure that one gets from being around these delightfully mischievous Reindeer. My tours can hopefully only get better nowadays, after a small incident last week, whereby on my first hill trip in four years I thought I’d try out my basic level French on a young boy. What transpired really shook my confidence in the French language; I asked the young boy a question and to my shock he swiftly sprinted over to his mum and grabbed her leg with both hands. 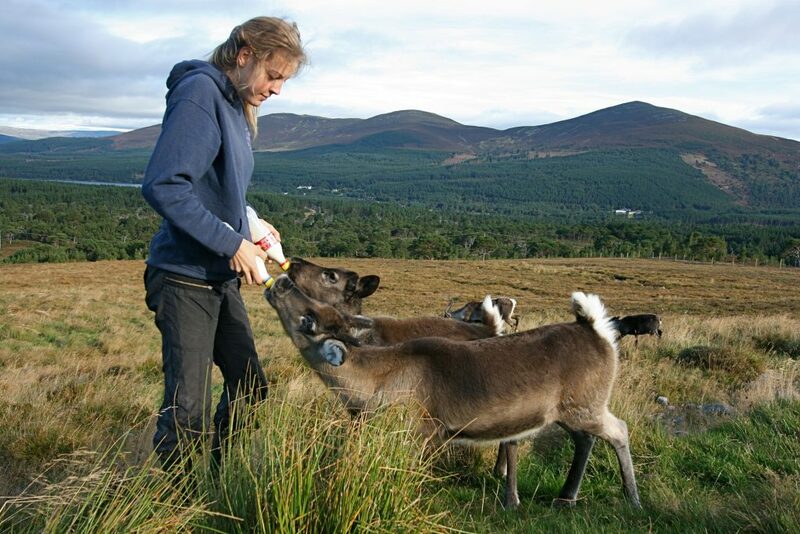 What I had meant to ask “do you like feeding the Reindeer?” actually came out as “do you like eating the Reindeer?”. And fair play to the young lad, he wasn’t interested in eating any Reindeer. I might stick to English in the future. Since I have not come across many Reindeer Physiotherapists, I may be set for a career with humans. 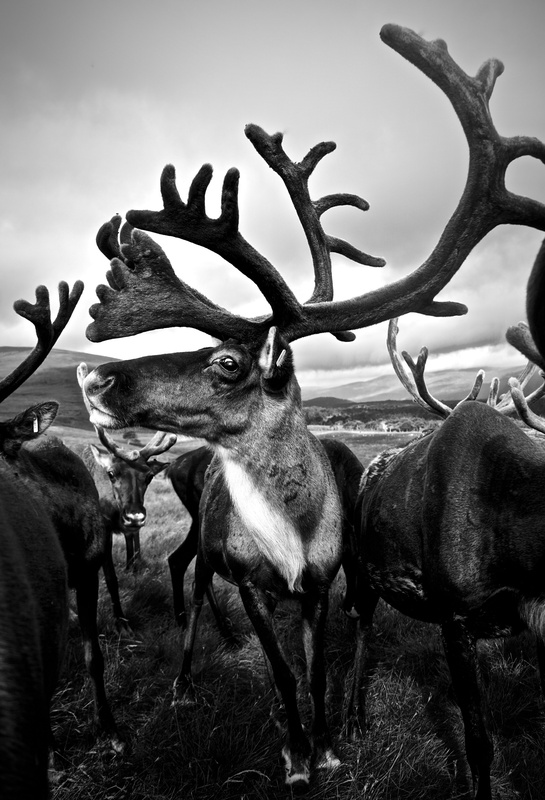 But, as they say…”once a Reindeer herder, always a Reindeer herder”. And I am thankful to all of you lads and lassies reading this for your dedicated support which allows such a wonderfully run business to thrive. 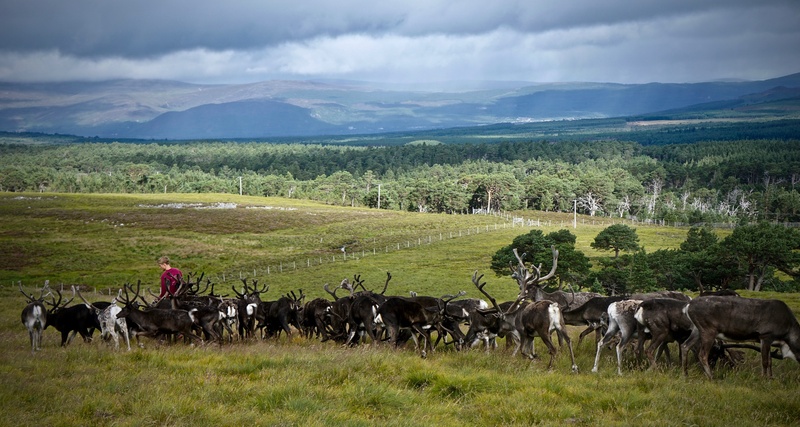 A scenario similar to this one has occurred many times since I came back to work at the Cairngorm Reindeer Herd this summer. 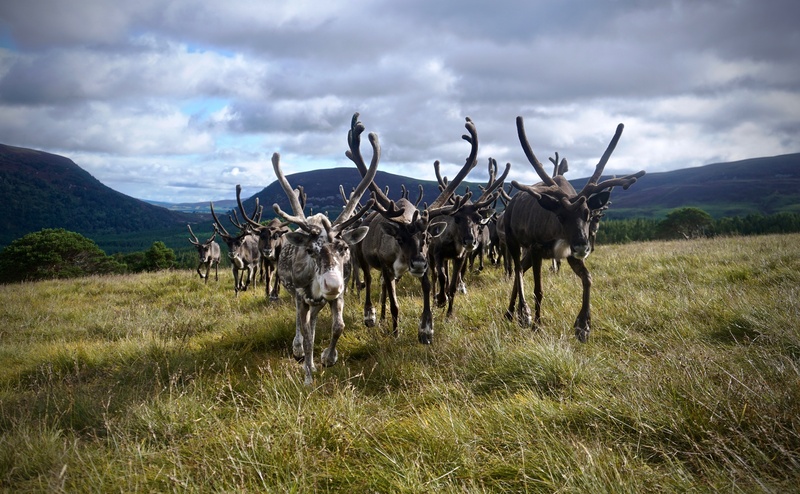 In the past blogs have been written about how herders learn the reindeer names, and I desperately read a couple of those in the hopes of finding ways of dealing with all of the reindeer names. People who have worked here for some time seem to be able to recognise a particular reindeer from a fairly long distance or a photograph, whereas I’ve been stuck in the phase of trying to sneak up on a reindeer to be able to read his ear tag number, after which I can use my cheat sheet to check his name. To change this the other way around I decided to have a little ID’ing session. 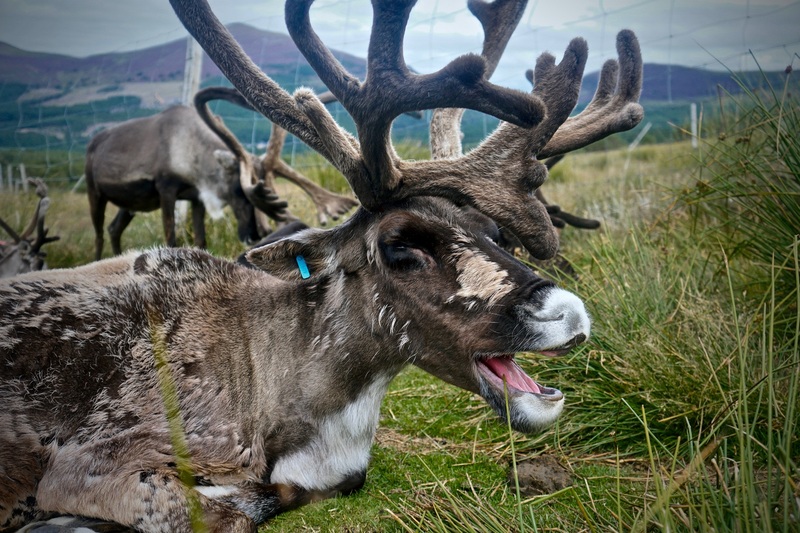 Like usual, I sneaked up on a couple of regurgitating reindeer to have a quick look at their ear tag number. 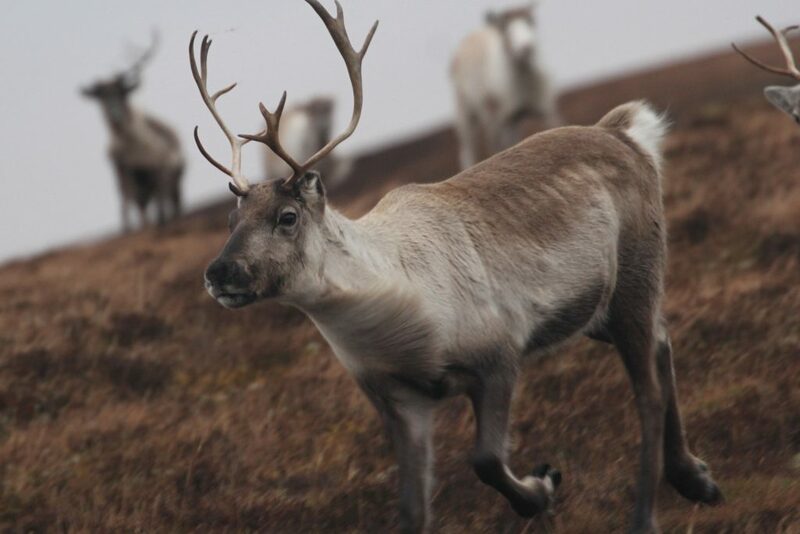 I always try to look at the reindeer’s distinct features first, but, to be fair, many look quite similar in the beginning and except from a few very distinct ones it can be really hard to spot something outstanding which tells the reindeer apart from the others. 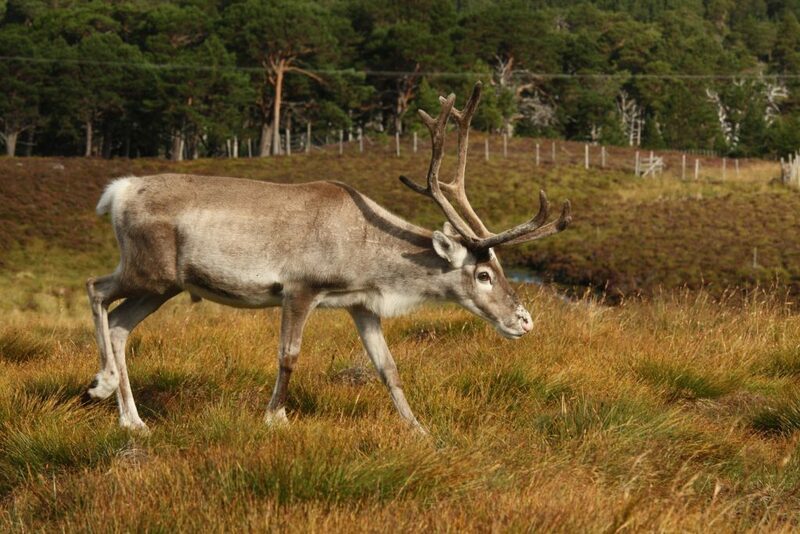 I think I followed reindeer Lomond all the way across the enclosure, trying to read his bloody ear tag number. It’s easier to read when they are eating their food, so while my colleague Hen distributed the food in nice small piles I started to ID them along the line. But, reindeer being animals, they moved about a lot. So it happened a couple of times that I was staring hard at a certain reindeer, hoping for an “aha” moment, not getting one, sneaking around him to check the ear tag number, only to find out I’ve just had him 3 spots back in the line! After going up and down the line a couple of times, with some reindeer encountered at least 10 times and others not once, I decided it was time to call it a day in terms of ID’ing. 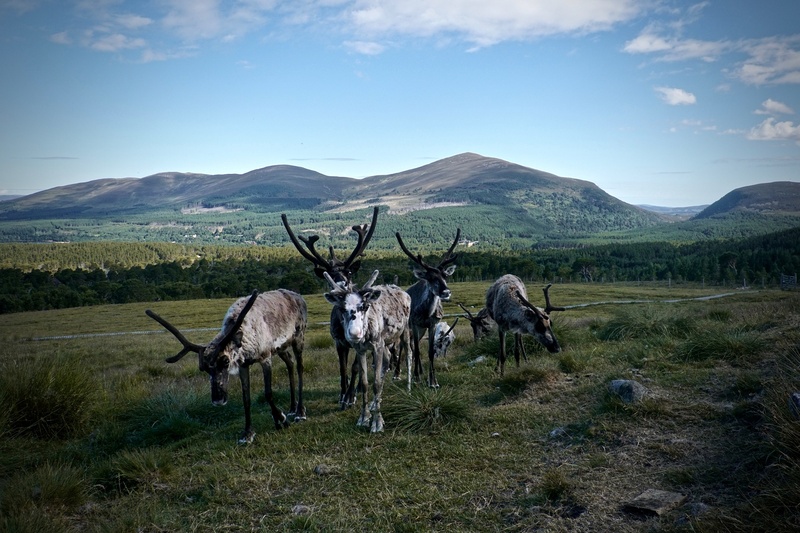 Unfortunately, as soon as I got back to the centre and looked at a photo I’d made that morning, I realised I couldn’t even identify the reindeer in the photo!! This meant it was time for drastic measures. ID’ing reindeer is quite important as the first way we know something could be wrong with a reindeer is when he doesn’t show up for breakfast, lunch, or dinner. 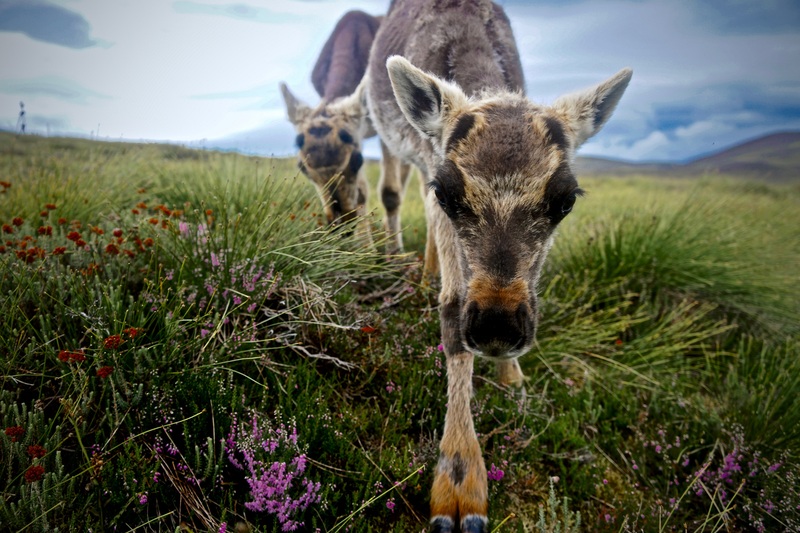 Reindeer like their food and just like you and me, if they’re not enthusiastic about eating, something’s the matter. 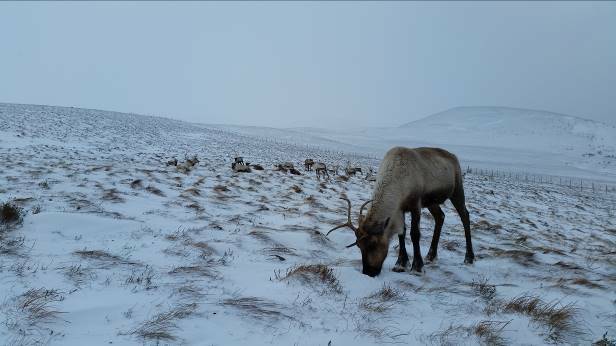 It is then the herder’s duty to quickly go over all the reindeer present to check who’s missing. 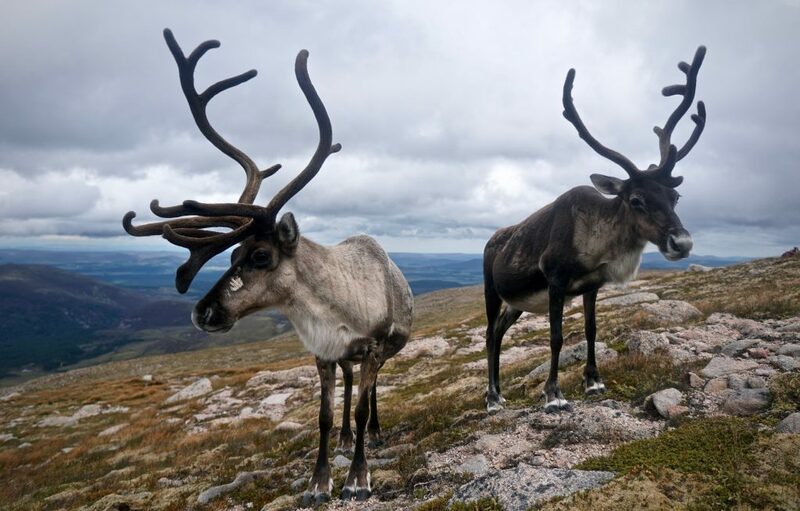 And since reindeer are not like school children in that they won’t dutifully participate in a role call, the best way to quickly do this is to identify each and every one of them by sight as soon as possible. So there you go, the quicker you learn the names, the better. As a last resort I decided to consult my own knowledge about learning in general. I’ve just finished my English teacher education at uni, so I’ve learned a lot about how people learn and memorise things. One of the ways people memorise vocabulary best is by creating mnemonic devices. One way to do so is to link the word you’re learning (so what it is) to something that sounds very similar to the word. For example, the French word for to eat is manger (pronounced mahn-zhay). A manger in English is a bowl or trough to put animal food in, link this word to the French word (same in spelling, different pronunciation) and you have your mnemonic device. Here are a few of the things I came up with, some of them made my colleagues chuckle..
Lomond (901) – Loch Lomond is the 1st landmark you come across when you walk the West Highland Way. Fyrish (903) – The (F)Irish flag has 3 colours. Spartan (004) – Spartans were born for (4) fighting. Olmec (008) – Olmec ate (=8) chocolate (The Olmecs were a Latin American tribe that were the first to consume chocolate!). Jute (013) – the Jutes brought bad luck (13 = unlucky) to England (the Jutes were a Germanic tribe that invaded England). Roman (018) – For a lot of Roman stories you have to be 18 or older to be allowed to read them … (The Latin stories about old Rome contain a lot of sexual harassment…). Burns (103) – When you have a 3rd degree burn wound you have to go to the hospital. Now I know most of the reindeer in the hill enclosure!